We offer a wide range of Metal Dish. With their traditional riveted construction and utilitarian origin, our handcrafted galvanized steel trays are perfect for entertaining outdoors. - Made of galvanized iron. - Detailed with carved wooden handles. This white Metal Tray meena is compatible with any place of the room in order to provide attractive look to the interiors. These white metal trays are available in various shapes and colors. These are widely demanded in every national and international market as they provide majestic & attractive look by enhancing every interiors. This simple brown tray with handles and raised edges prevents the things from sliding down. 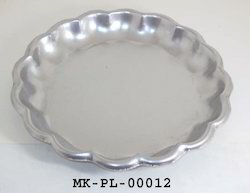 We are reckoned entity of this domain indulged in providing an enhanced quality Metal Serving Tray. We are the leading Manufacture supplier exporter of Metal Hand Painted Tray and offer this product as per client requirments and this product made by our expert with Good quality and i am looking for bulk order. Backed by rich industry experience, we are engaged in providing a premium quality range of Bronze Tray. This Handcrafted Metal Tray is compatible with any place of the room in order to provide attractive look to the interiors. These Handcrafted Metal Tray are available in various shapes and colors. These are widely demanded in every national and international market as they provide majestic & attractive look by enhancing every interiors.